Good morning from El Segundo, where most of the Kings emerged from the dressing room at or shortly after 10:28 a.m. following a video session. Notes! -Because there wasn’t a full group on the ice, line rushes weren’t particularly illuminating. 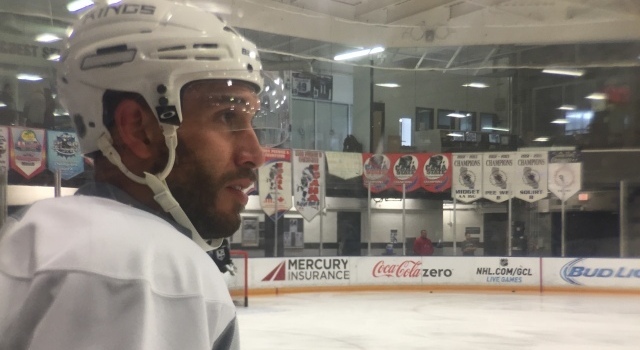 But based on Nick Shore and Jamie McBain remaining on the ice for extra work with Matt Greene, it does not appear there will be changes to the team’s lineup when the Calgary Flames visit for the second and final time this season (7:30 p.m. / FOX Sports West / KABC 790 / I Heart Radio). Expect Anze Kopitar to center Tanner Pearson and Dustin Brown, Jeff Carter to center Milan Lucic and Tyler Toffoli, Vincent Lecavalier to center Dwight King and Trevor Lewis, and Nic Dowd to center Kyle Clifford and Andy Andreoff. Kris Versteeg could be an option up front as he nears his return from the foot injury sustained when he blocked a shot from Dennis Seidenberg’s two Saturdays ago. 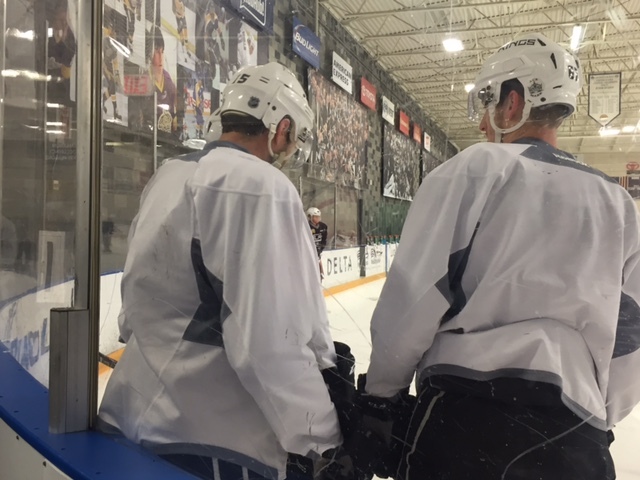 Defensive pairs should remain McNabb-Doughty, Muzzin-Martinez and Scuderi-Schenn. -Jonathan Quick didn’t take the ice this morning, but he’s still the likely starter in net, as Jhonas Enroth wasn’t hasty in leaving the ice and stayed on to work a little bit with Shore, McBain and Greene. As always, wait for the song. -Calgary lost 8-3 in Anaheim last night – their 23rd consecutive loss at the Honda Center, tying an NHL record for the most consecutive road losses to one opponent – and held a very limited skate at Staples Center this morning. Johnny Gaudreau didn’t play last night but has been day-to-day and could very well play this evening. Also on Kings Weekly: Ice-level interviews following the championship game at Staples Center two weeks ago, coverage of the league’s award ceremony, and a Bark Madness update.